Senior Health & Resource Fair - Free! Finding unique challenges in your garden? 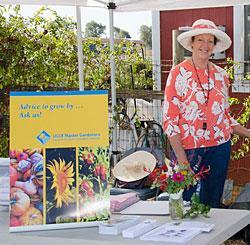 Bring samples of your problem plants, mystery pests and questions to the “Ask the Master Gardeners” information table at the Senior Health & Resource Fair in Citrus Heights. Get one-on-one advice based on the most recent research-based sustainable practices from Master Gardeners who have decades of gardening experience. For all your gardening questions, including pests and diseases, growing fruits, vegetables and herbs, ornamentals and trees, composting and water efficient landscaping, UCCE Master Gardeners have the answers.